I must admit that from the moment I had heard Keep Your Weeds, one of the songs from Jex Thoth’s new full-length album Blood Moon Rise, I was bursting with excitement to see them live once again, ever thankful to Blow Up That Gramophone to bring such a treat to add a bit of extra enchantment to Finnish summer. 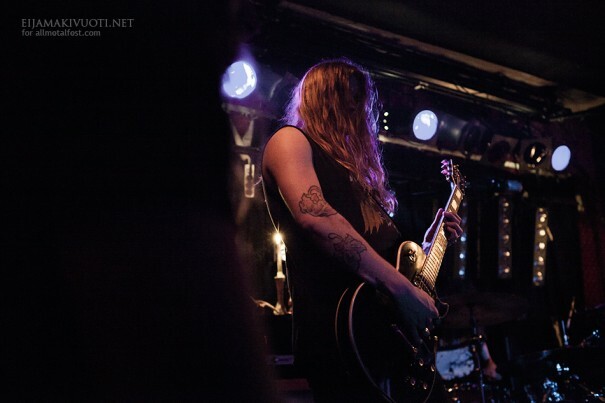 The Finnish leg of the Blood Moon Rise tour took Jex Thoth to Turku, Helsinki, Jyväskylä, Oulu and Tampere. 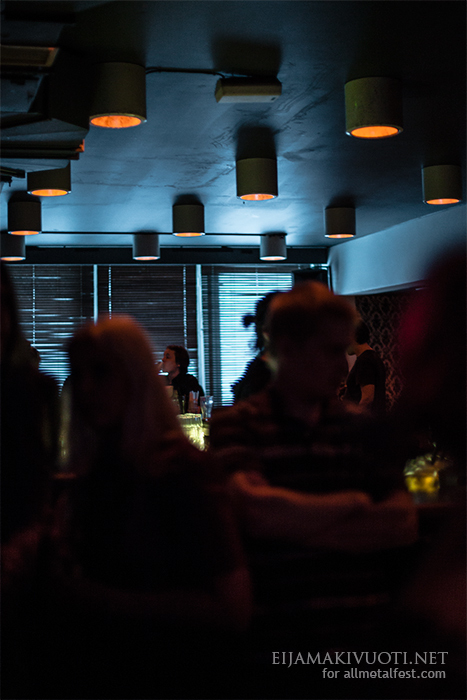 The Helsinki date was again to take place at Kuudes Linja, this versatile venue that is centrally located in Kallio and again on a Thursday which put the time table at a quite early 8 p.m. door opening as the Thursday nights belong to Kuudes Linja’s Thursday club. I was riddled with impatience for the days to pass until 6.6.2013 finally would arrive and carried the hope of experiencing a magical night and laying my ears on the new songs everywhere. I was playing Jex Thoth new and old over and over again leading up to that day. The two pre-released songs Keep Your Weeds and The Four of Us Are Dying were whispering promises of a great gig and album to come. Especially Keep Your Weeds had captivated me with its delicate and sweet melodies tenderly sung by Jessica a.k.a. Jex while being heavy and powerful at the same time. I do not know what it is with Jex Thoth and me but I always can listen to them and fall in love with the music over and over again so this is a highly subjective text, maybe “ode” would be a more suitable term than report. But since I first saw them at the Hammer Open Air after show party Jex Thoth had their fixed place on my play list and while their gig at Tuska 2011 had been great too, it was even better to see them in their Blood Moon Rise head-liner tour again with the new record on board. 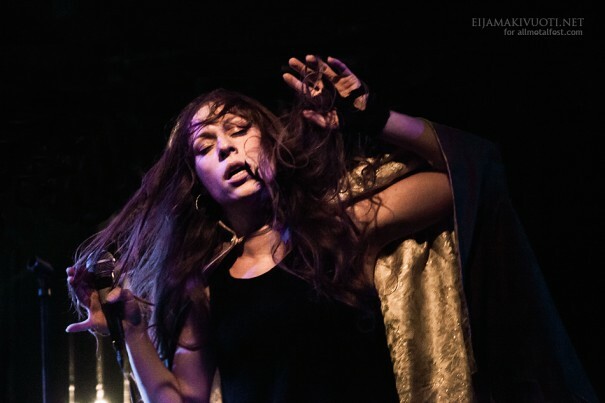 While I can and do listen to Jex Thoth during any time of the year, especially in summer their music seems to gather even more power and magic – it seems to be the perfect soundtrack to a bright Finnish summer night. And this 6 June was a summer night in Helsinki indeed – the thermometer had been climbing up to +30°C during the week and that Thursday was the prototype of a summer day: Hot and sweaty during the day – sultry and delicious during the night. The only downside to this was that the gig was held inside Kuudes Linja. How perfect it would have been to see Jex Thoth perform outside under the (almost) midnight sun with the birch leaves dancing and whispering in the light summer breeze. But as that was wishful thinking, it was time to make my way through Kallio’s streets that were still radiating the heat of the day to Kuudes Linja, wondering if the temperatures inside were bearable or on sauna level. Arriving what I thought was just in time for the warm-up Sink (not that anyone needed to actually feel any warmer) Kuudes Linja was not full yet but still well visited. The tickets were slightly on the more expensive side for a two band concert with 18€ but that clearly did not bother too many. In the end, Sink started 20 minutes late which gave ample time to observe the mixed crowd with surprisingly few familiar faces in their summer metal wardrobe and trying to not melt in the already well tempered venue. Both the bar and stage side were equally hot but luckily with a step into the stairway one could get a little breather and the stairs led downstairs and outside into what felt like cool, fresh air despite the cigarette smoke. When Sink finally started I once again felt bad to drag my photographing counterpart to these gigs as the stage remained mostly dark even so that it took me a while to realize how many guys there were on stage. Yet, even if you did not see them you could feel them or rather their music. The long, booming and humming beats of the intro could be felt and heard and singer Aarno’s voice wove itself into the soundscape as an integral part rather than an autonomous part itself. The song or songs grew louder, more intense, pulsated through Kuudes Linja and your stomach and cells. How Aarno managed to wear gloves and a jacket without melting is a mystery to me as the stage side of Kuudes Linja filled up during the first songs and the air got more and more stuffy. While it was difficult to make out the other members of the band in the low light, Aarno was busting out gestures full of energy and like that ruptured the throbbed monotony of the music. Aarno’s presence on stage was strong and he stayed on despite long instrumental parts and it seemed natural for him to be there. 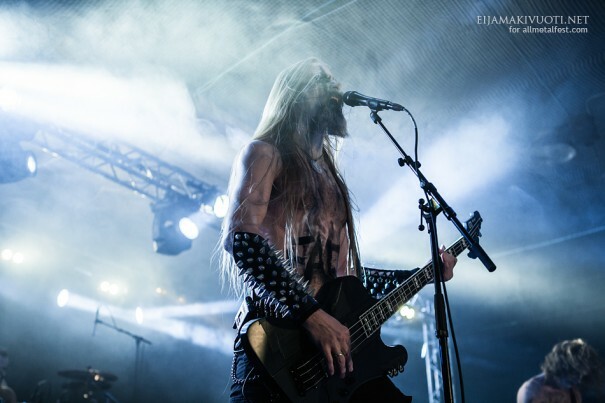 The consistency of the soundscape at times was suddenly disrupted by blast beats and a sound that reminded me of old black metal demo tapes just to go back to slow, buzzing bass-dominated parts that resonated in your whole body. This was the first time I had ever seen or heard Sink and while I found them interesting and intriguing, they probably were not the best opener for this concert as it was just too hot to get into their not-easy-listening-music. So after Sink’s set a quick air break outside was an absolute must to cool off and get my mind free of anything else to be able to just enjoy Jex Thoth. A visit at the merch table was nevertheless worth remaining inside as you could buy their new album that officially will be released on June 15 very fairly priced at 15€, as well as different colored vinyl versions and shirts (e.g. girlie tank top for 15€). 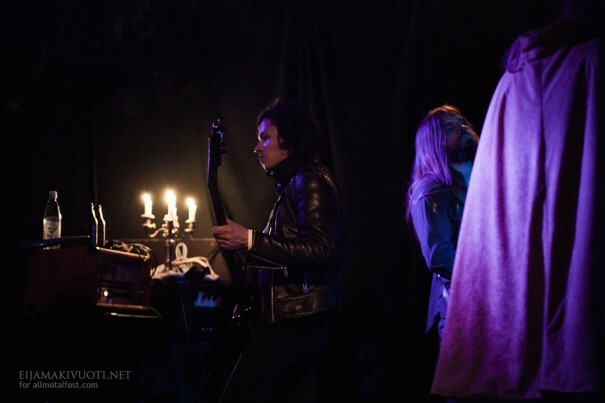 On stage, the candles were being lit and Kuudes Linja started to fill and heat up ever so slowly until with a 30 minutes delay Jex Thoth finally came on stage, Jex in her stage cape, burning olibanum, cleansing the venue. 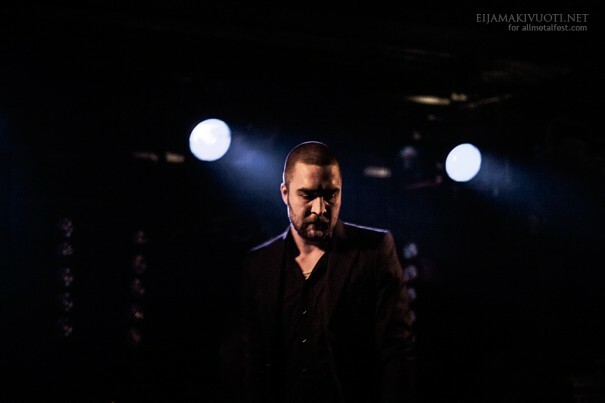 To say I was captivated from the first millisecond on would be lying – I had been captivated from the moment the gig had been announced yet the first sounds of To Bury, which is also the first song of the new album, sent shivers down my spine. 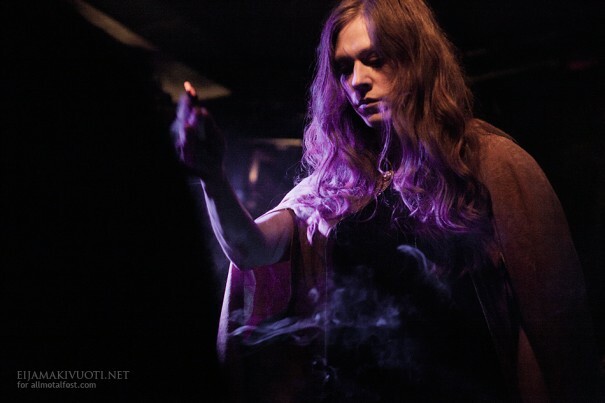 The deep bass, the slow, intense beats and then Jex’ voice all dragging you into this magical state, the music running through your body, deep into the bones, embracing and compassing you, grounding you in the earth while taking you to the stars. These are these moments where music touches your inner most heart and soul inexplicably. From the intensity of the short first song to the more groovy The Places You Walk, the set continued with a mixture of old songs such as Separated At Birth, Son of Yule and new ones like the already known Keep Your Weeds and The Four of Us Are Dying. 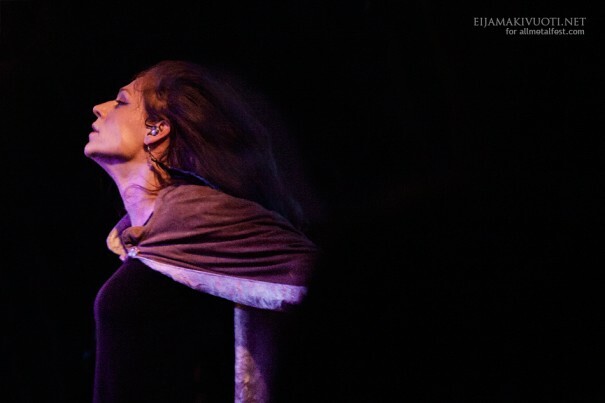 At times the sound was not as good as it could have been or rather not all elements of the songs came through equally well as on the records but that did not take away from the atmosphere of the gig or Jex’ charisma on stage with her eclectic gestures that accentuated the songs. The temperature at the stage side of Kuudes Linja rose during the gig which is the only reason I can think of why most of the audience remained so calm while I just had to move and close my eyes to soak up every little bit of music and energy. I knew should be watching the gig to report here but there just was no other option than to succumb to the music and this sultry, sticky swe(e/a)t(y) summer night – let it caress you and follow Jex’ evocation of music magick. The applause between songs made it clear that despite their cool composure the rest of the audience were clearly appreciating what they heard and saw. After a much too short set and Nothing Left To Die as an encore the evening had come to an end and it was time to head home through a Finnish summer night whose texture is captured so well in Jex Thoth’s music: the melancholy of magical summer evening moments that are utterly fleeting and doomed to pass – the inexplicable longing for something that is unknown or even inexistent.